This typographic product and its digital files are (c)2001 Nerfect Type Laboratories and Britton Walters. As it took quite a bit of time and effort to create this typeface we are now equally dedicated to it’s proper and legal use. Please be warned that you will accept the conditions and terms of this license agreement by downloading, purchasing, or installing this font or family of fonts. In return for a license to use these digital files you agree to the following terms and conditions. Please keep this file with our fonts or your license will be terminated immediately. You may not copy or duplicate any of our fonts in any form (except for backup purposes) unless you get written permission from Britton Walters. This also means that you will not distribute these fonts and other included digital files on your website, cd-rom, etc. We can handle that ourselves. When production credits are listed please include us. We love to see our fonts used in cool projects and we think as our font made your final piece what it is we could get a credit in these production notes. Send us a sample if you can and you’ll make our day. We try our best to create fonts you can type complete English sentences with, and our top-notch pay fonts often carry a full complement of foreign language characters. 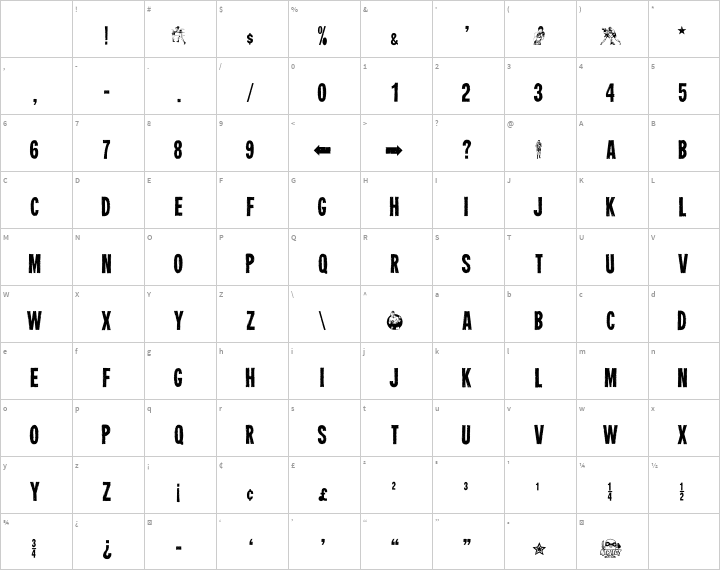 You will find however that many of our free fonts lack some punctuation or numerals. Often times these fonts are created for limited uses or as pure display faces more ideal for headlines than body copy. What did you expect for free? Please do not use any of our dingbats as or as part of a logo. They are meant to be used with our typefaces and at certain sizes. The sets included with or as fonts on their own are not meant to be corporate identities. Please contact us for permission if you just must use one of our images as part of your logo. In most cases we can provide you with artwork to better suit your needs, and for reasonable rates. Each font we produce comes with a custom icon that we created. In some cases an entire set of icons will be included. Please feel free to spruce up you desktop with them, but don’t use them for your own commercial uses. If one of icons would be perfect for one of you digital projects please get our permission to use it. This license is effective until terminated. We have the right to terminate your license immediately if you fail to comply with any term of this agreement. In no event will we, the makers of the font(s), be liable to you for any consequential or incidental damages, including any lost revenue, profits, goodwill or savings, or for any claim by any third party. 1.From the Control Panel open the Fonts folder. 2.On the File menu, click Install New Font. 3. Click the drive and folder that contain the fonts you want to add. 4.To select more than one font to add, press and hold down the CTRL key, click the fonts you want, and then click on OK. To select a range of fonts in the list, press and hold down the SHIFT key while dragging the cursor over the fonts. To add fonts from a network drive without using disk space on your computer, make sure Copy fonts to Fonts folder is not checked. 1. Many of the “free fonts” include amusing dingbats. If not originally drawn by Mr. Walters, many of these dingbats have been scavenged from a variety of sources and then altered by the designer. Because no certain guarantee can be made that the original creators of these scavenged works agree with this application of their material, and frankly, because many of these images (due to the process of converting them into the font format) look like garbage when blown up to larger scales, we kindly request that you do not use these dingbats (original or scavenged) as logos for commercial enterprises. 2. If you are using these “free fonts” for commercial reasons, especially for a large corporation, we here at Nerfect.com kindly request that you purchase something from our delightful Garage Sale section. Yes, we distribute these fonts free-of-charge, but wouldn’t it be nice to thank Mr. Walters in some little way, especially if the use of his fonts really “wowed” your newest client? By purchasing some buttons or stickers (which you can totally write off on your taxes or expense to your company) you’ll make things “cool” between Nerfect.com, Mr. Walters and you. 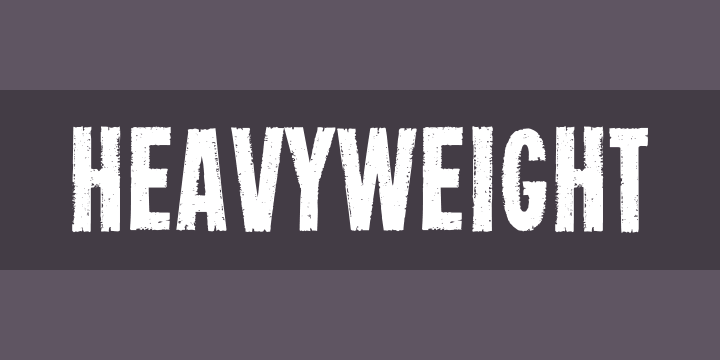 From the Nerfect website: The name HEAVYWEIGHT has little to do really with the boldness of the letters, although they are indeed bold in their own way. While doing research for another typeface in an ancient newspaper art resource book this face jumped out at us. The perfect font for making a poster for a championship bout or for the look of cheap printing and poor ink coverage. We’ve added a few of our own charcters to the face and have dropped in a handful of pugilistic dingbats. Heavyweight KOs other fonts in the first round.